You may want to stop in at the roadside attraction on Tuesaday evenings for an event we call Woosday, a gathering of Portland burners from all different camps that get together to have a beer and socialize about random crap. ACME will be at 9:00 Portal and A this year, minus The Walking Beast, but we will have some new fire toys. Stop by we may let you push the button! Topic: 2013 Art Car Ideas?? Re: 2013 Art Car Ideas?? I would think that a tractor centrifugal force pre-filter would be ideal. They use them for baja trucks and can be found at tractor wreaking yards or maintenance shops. Finding the right size might be a little tricky, but worth checking into. Topic: The Beast is back! Re: The Beast is back! The music is from an art car that pulled up right as we started filming. Topic: Fundraiser: Help The Walking Beast burn brighter this year! New cool Kickstarter stuff: Pyrosaurus head replica! The Walking Beast could use some help with fundraising for propane and the new flame effects this year. 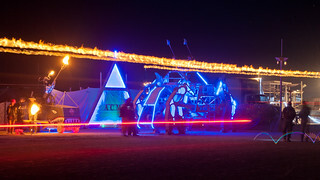 see our fundraising eplaya thread here http://eplaya.burningman.org/viewtopic. ... 93&t=56560 and feel free to pass along this info. Thank you and look forward to seeing everyone on the playa. You need at least one headlight and tail lights, The lights don't have to be very bright but, you still need them. I've known people who use a small headlamp flashlight as there headlights. Tail lights can be red leds. Fundraiser: Help The Walking Beast burn brighter this year! Topic: Just bought a crazy golf cart: what should I turn it into? Correct, it's been on a few other shows as well. We are adding new lighting and additional flame effects this year as well as an improved steering system. Look forward to meeting you on the playa. 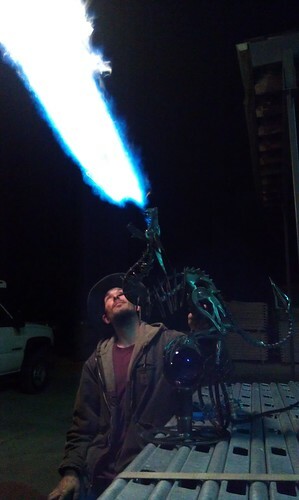 The last link didn't work, heres the photo of a test with Pyrosaurus, we should have her finished in time for the burn this year. I created a new friend for The Walking Beast, We call her Pyrosaurus and currently she's burning a little hot! The Walking Beast loves soft playa, it can move faster on softer ground. I'm looking forward to this year regardless of what the weather is, but I would feel dissapointed if there isn't at least one good dust storm. I'd settle for a good thunder storm as well. Another option is a powerline alternator. They are used on semi trucks and are rated for 190 amps. The alternators are about twice the size of a gm alternator and will require making custom monting brackets. Wiring is easy just a power and ground wire. I should have the quad flame poofer mounted on it this year as well.